BarleyPlus is a mix of 60% pure raw organic green barley juice powder with 40% raw organic alfalfa juice powder added to complete the nutrient profile. 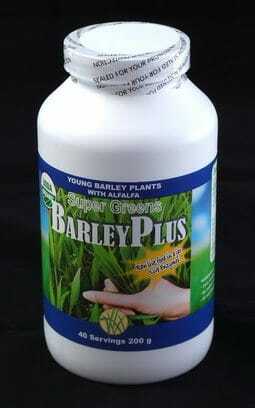 BarleyPlus is grown at 5000 foot elevation in a pristine valley surrounded by volcanic peaks. Artesian wells from rich volcanic sources replenish the minerals constantly. The fields have been farmed organically for 30 years. When the leaves get about a foot high (before the grain forms) they are harvested and juiced on the tractor. The juice is chilled and the fiber is returned to the soil as compost. The chilled juice is brought back to a proprietary dryer invented by the farmer, where it is flash dried at less than 96 degrees Fahrenheit in 30 seconds. Nothing is added – only the water is removed. Storage life is more than two years. When mixed into water the juice is vibrant green, does not settle, and will actually go into photosynthesis if placed in sunlight! This is the best food we put into our bodies every day. It gives us a foundation of raw organic nutrition every day, and amazing energy. BarleyPlus has a very high level of enzyme activity which allows the vitamins and minerals in BarleyPlus to be used by the body. We are proud to offer the finest quality organic barley and alfalfa juice powder on the market today. We’ve blended alfalfa juice with the barley juice to optimize the nutritional values and achieve the highest macro and trace mineral content possible. Extensive research and testing ensures that the levels of vitamins, minerals, enzymes and antioxidants in BarleyPlus are among the highest in the industry. BarleyPlus contains 100% organically grown barley juice concentrate and a smaller amount of enzyme-rich and nutrient-dense alfalfa. Alfalfa plants have roots that reach deep into the earth, drawing out precious trace minerals that are not found in other grasses. Chlorophyll has been shown to accelerate wound healing and has no toxic side effects. It provides protection against chemicals and radiation, and inhibits the carcinogenic effects of common dietary and environmental chemicals. It inhibits the growth of germs by providing an environment in the body that interferes with their growth. Chlorophyll even promotes intestinal regularity. Natural vitamins such as those found in BarleyPlus are never isolated but always found in food as living complexes. While there are many known components making up a vitamin complex, there are just as many unidentified naturally occurring components. These complexes are found in a synergistic blend that is biologically available, and easily assimilated at the cellular level when taken into the body from raw food sources such as BarleyPlus. Minerals in their natural form are always combined with specific amino acids, and sometimes with vitamins in a process called chelation. Our bodies are designed to consume minerals only in this chelated form. BarleyPlus maintains the natural form of these minerals for the body to use easily. Antioxidants help rid the body of free radicals that travel through the body “burning” everything they touch. These free radicals play a large role in disease and aging. The body has natural defenses for them in our immune system but these defenses can find themselves outnumbered. BarleyPlus is a good source of the antioxidants the body needs.